I am looking forward to welcoming 12 teams of students to Aston Conference Centre in August for five days ed tech fun and some series design and development. This is my 6th year of running student ed tech activity over the summer, we started the Summer of Student Innovation in 2013, each year it has bee slightly different and this year is no exception. The teams include 7 winners of the Edtech student ideas competition who have received a £2000 prize to support their team and design or their edtech idea. SurveyTandem. Team lead: Jakub Zimola, University College London. A web site to get people to take your student online survey for free by filling out theirs in exchange! The team are developing a free website on which anyone can post a link to their online survey and automatically collect responses in exchange for taking surveys of others. App to the Future. Team lead: Brad Forsyth, Ravensbourne University London. The app is a directory of different university courses, work experience and apprenticeships available. It allows students to search by location, skill and subject for an experience suited to them. Authorencity. Team lead: Hriday Agarwal, University College London. An AI tool to detect essays that have been outsourced by students and submitted as their own for grading purposes. TransArt. Team lead: Lenette Lua, University of Warwick. A community for arts passionate minds. Providing affordable content to people of all ages. Citation Gecko. Team lead: Barney Walker, Imperial College London. Explore the citation network and discover relevant scientific papers! StudBud. Team lead: Ulas Can Erguney, University College London. A chat bot that helps students learn easily. We are developing an awesome chatbot that will make studying much easier and more efficient, making students’ lives better. All of the teams will participate in a five-day design sprint based on the GV Sprint Book and supported by mentors and experts from Jisc and Emerge Education. Teams will explore their ideas in more detail, explore users journeys, develop a wireframe prototypes or enhance existing products and undertake user testing at each step. All teams will pitch to a panel of invited guests with representatives from Jisc, Emerge Education, The House London Ltd, The Student Room, and the Department for Education. The panel will be looking for ideas that they can support through further developmental approaches. The teams will be provided with equipment including a Raspberry Pi 3 B+, camera modules, sensors, NFC readers and lots of connectors to develop prototypes for data collection to support the intelligent campus. They will be supported by developers from Jisc and Pan Intelligence (an Analytics & Business Intelligence Software Provider) who are also providing access to their data visualisation tools. The hackathon teams will be competing for prize money of £1000 which will be awarded on the final day of the event. The competed products will be used to collect data and inform Jisc’s ideas in developing a project around the intelligent campus to compliment the Learning Analytics Service that goes live on the 1 August 2018. I expect the week to be totally exhausting, great fun (lookout for images from the serious Lego design activity) and very insightful about student ideas around edtech. 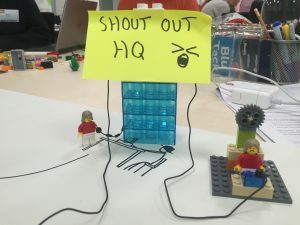 All the team from Jisc benefit greatly from working with the student teams to explore and develop new areas of edtech and I hope we can share some insights following the design sprint and hackathon. 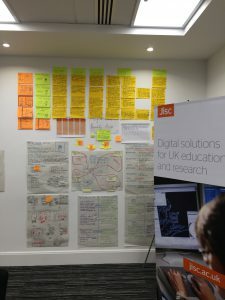 Will we be doing it again – probably but it wil change and develop each year so keep an eye out for Jisc edtech activities on this blog and social media. Posted by Paul Bailey on 23/07/2018 in student ideas.